The sun arose with me on my last day in Bolinao. I have witnessed its demise the previous afternoon, radiating a final magenta warmth over the whole land and introducing multitudes of tiny sparkling stars as the twilight passed into evening. 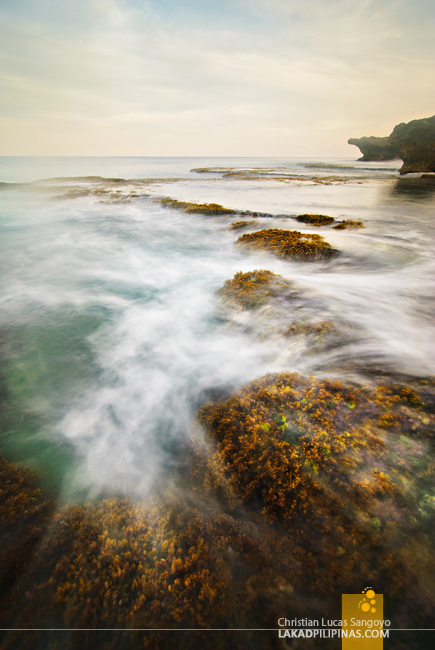 Now I await as it slowly resurrected itself at the other side of the land, unseen from the rocky shoreline of Patar Beach where I was currently standing, again waiting for it to paint the land with its golden hues. It peeked through the mountains, through the trees; transmitting yellows, oranges and reds. Painting the western clouds with soft pastels, providing the landscape with surreal colors. A sight blessed to those strong enough to ward off the temptations of a soft bed and a cozy blanket. 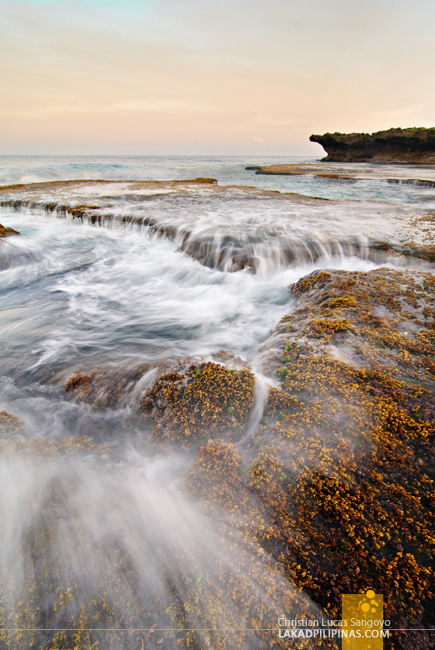 The tide was at its lowest but the waves were at its worst. 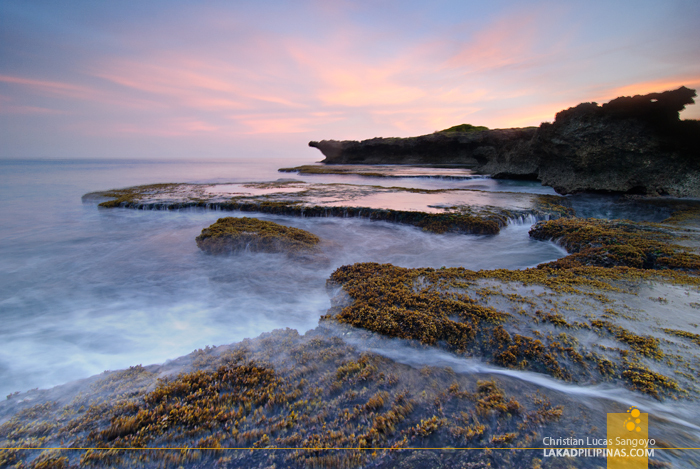 The plateau-like platforms replete with gold-colored seaweeds extending from the shoreline to the sea were now fully exposed. I can see how it forms some sort of a jigsaw, extending further than what I reached the previous day. But the waves were not to be trifled with. Much as I liked to reach the farthest platform, I can just imagine how everything would look from that vantage, the strong sucking tides bade no way for me to do so. I was not about to leap into the unknown and risk everything for a single frame of photograph. My limits has been made known to me a couple of years back when I backpacked solo to Sagada. The water crashed and ebbed like clockwork. Its massive power hypnotizes and lulls; surging upwards towards the platforms, it stops for a microsecond. Then it pulls back with all its might, straining the weeds backwards and creating a mini-waterfall back into the sea. 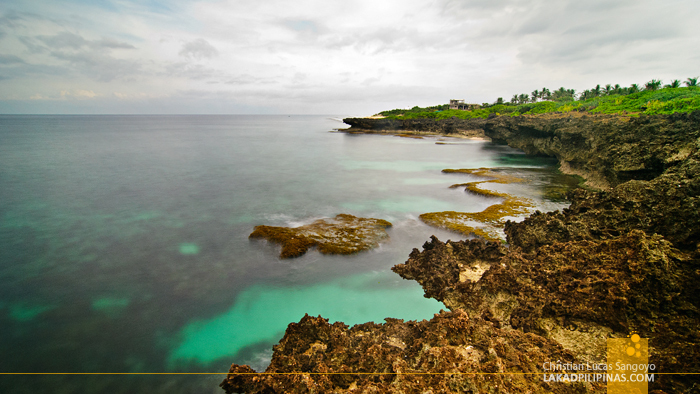 With the pastel colors of the morning gone, I decided to climb a jagged cliff adjacent to where I was staying. There I found more of the curious sea platforms. 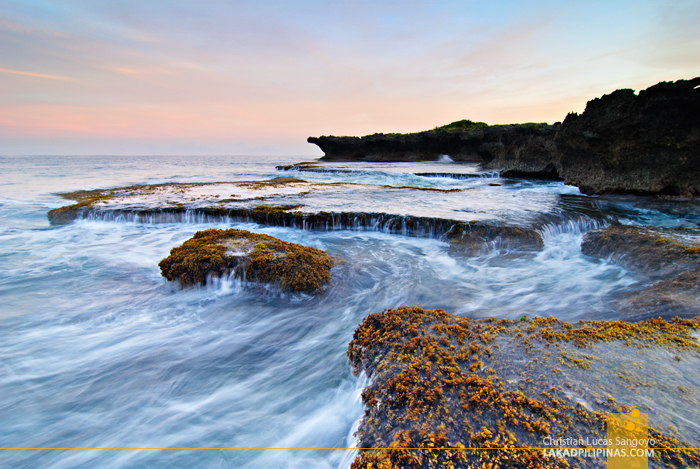 They were also ridden with golden seaweeds, a sight which seemed particular only to Bolinao’s Patar beach area. And after so many wet encounters, scratches and bug bites, everything ends on a cup of coffee; by the beach, with my feet up on a bamboo bench. 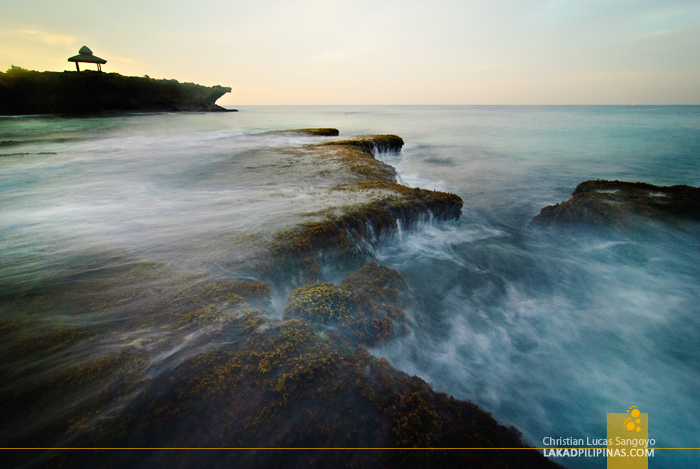 What started as a posh invitation to review a swanky beach resort ended in a roughing it out, crazy wave-ridden escapade at the Patar Rock Formation. I did so many things and explored so many places that I cannot believe it has just been three days since I left for Pangasinan. Aww, di naman Genius haha! Just how do you do that? Turn places to a magical scenery. Lovely! Fan of your works here!